Christianity Explained presents the challenge of Jesus in a non-threatening way. In many countries people growing up today do not have a Sunday School understanding of the gospel, or even the basic facts about Jesus. 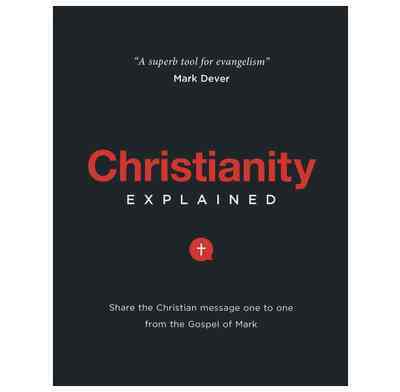 Christianity Explained gets away from the quick one-off presentation of the gospel which has characterized much of our evangelistic efforts in the past. Based on six studies from Mark's gospel, this 'manual' is a tried-and-tested tool for evangelism. It presents the challenge of Jesus in a way that is non-threatening and concentrates on the facts concerning the person and work of Christ. It begins with the assumption that the hearer knows absolutely nothing about Jesus or the Good News. During the course, participants will be invited to discuss and question what they are hearing and, by the end of the six 'studies', will be challenged to repentance, belief and a trust in Jesus. The course, initially compiled by Scripture Union in Australia, has proved especially effective in 1-to-1 work. A number of translations are available through the Christianity Explained website. I have just started using this and it has been a great addition to outreach. It's compact (6 weeks), but doesn't leave anything out. Great explanation of sin and man's depravity. I'm looking forward to using it more and in different settings. A huge plus is that the "homework" handouts can be copied and there's no need to by additional student books. Wonderful work! The ability to review the contents of the course was very helpful. Thanks! Our elders have trained all our small group leaders and use the material to go into homes that have been opened to present the course to church members who bring their family and friends. We have started a course with the youth on a Friday evening and the ladies groups will be going through the course as well in the future. Wonderful material and easy to apply and use to evangelise. Clear simple points communicating the Christian basics from Mark's Gospel, not the last word but a really helpful first start for people. Great that its only 6 sessions, all sessions concise and to the point. I used this to start a new "Sunday School" class. We advertised using the materials provided. It was only for people who were not regularly in a Bible fellowship. We had six students. I was thrilled, all six showed up for the second week. In fact only twice was there an absence and they each came to me to pick up the handout when they could not stay for the fellowship. All six now have an understanding of Christianity and after The Bible Explained I expect will be ready to join a Bible Fellowship. They will probably all go as a group as they are comfortable with each other. The age range is 46-65 that just showed up. I'm into my second group and I love this course! No conversions yet, but the Spirit of God is definitely working in my people! Really easy to teach and understand! I am going through Christianity Explained with a small group at work. We only have half an hour together so we really motor. Six sessions is the right number for us. The course structure is good and the teaching points are clear and concise. The handouts are helpful. The homework sheets are useful for those who want to dig deeper and read the whole of Mark's gospel. The book has provided me with all the guidance that I need. We are using Christianity Explained as our follow-up course after the Passion for Life Mission. It is far easier to organise than Alpha; requires only a six week commitment; focuses on basic issues of the gospel; has a strong section on grace & faith, not works; is based on an exploration of Mark's Gospel, so doesn't require extensive Bible knowledge. Of course, you can always invite people onto Alpha as the next step, but this is probably the place to begin. This course is less comprehensive than Chrisrianity Explored, but nonetheless achieves it's aim in a less in depth way. I consider it more suitable to teenagers and Bible Class settings In this sense it is more versatile than Christianity Explored because pages from the manual are simply photocopied for attendees - making the material ideal for youth week-ends or even a Holiday Bible Club. The main advantage with Christianity Explored is that each attendee gets their own handbook - so better for further study or review.This is not to say that Christianity Explained couldn't be used in an adult setting to good effect, but that it is considered that Explored gives more scope, whereas Explained drills the subject down to more simplified issues.